Trashumante permanently receives unpublished research and of theoretical and methodological reflections papers, as well as essays and book reviews. This papers are evaluated by the Editorial Committee and outside evaluators. After the evaluation, the publishing of the paper is scheduled by the Committee, in consideration of the number of approved papers. 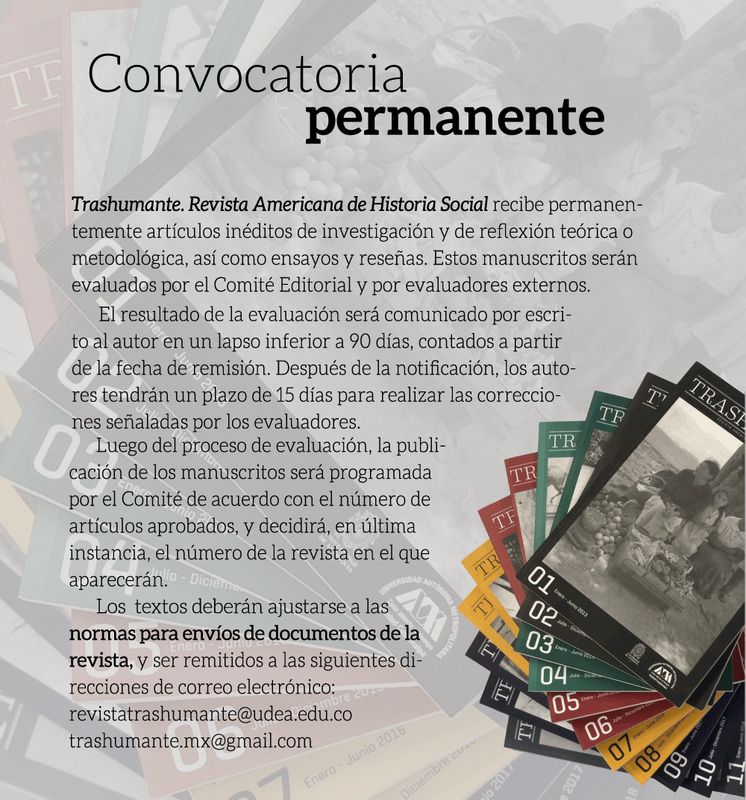 The Direction of Trashumante verifies that each received paper is appropriate for an academic journal of history and that suits with the minimal quality criteria, editorial and citation standards. Once the paper has been evaluated, each text is subjected to two anonymous academic referees. Every case of doubt or contradictions in the reports will be solved by the Direction of the journal by means of a third referee. On the basis of the report, the Editorial Committee will take a final decision that can not be appealed. The result of the evaluation will be communicated by letter to the author in a time between 90 days, starting from the day of emission.